Home / IPL / IPL 11 / IPL 2018 / IPL 2018 Match Preview / Jaipur / Match Prediction / Rajasthan Royals / Royal Challengers Bangalore / Sawai Mansingh Stadium / IPL 2018 Match 53 RR vs RCB Match Prediction, Preview and Head to Head: Who Will Win? 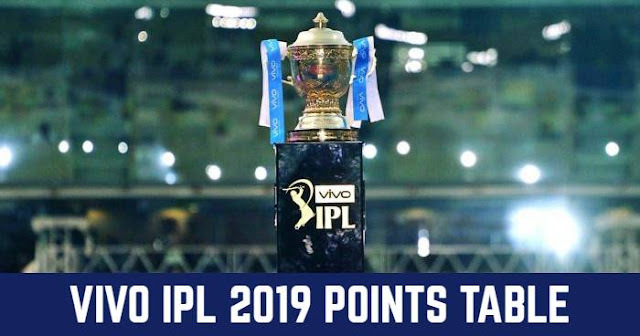 IPL 2018 Match 53 RR vs RCB Match Prediction, Preview and Head to Head: Who Will Win? Rajasthan Royals (RR) and Royal Challengers Bangalore (RCB) will play the 53rd match of Indian Premier League – IPL 2018 on 19 May 2018 at Sawai Mansingh Stadium, Jaipur. This will be last league match for both teams. Hot and sunny day in Jaipur with the temperature reaching maximum to 42ºC at the start of the match. There are cracks on the pitch and no grass at all. The surface will get slower as the match goes on. The captain will look to bat first and then use the spinners along with the long boundaries. 165 should be a par score. Rajasthan Royals are 6th on the points table with 12 points in 13 matches; 6 wins and 7 losses. On the other hand, Royal Challengers Bangalore are 5th on the points table with 12 points in 13 matches; 6 wins and 7 losses. The absence of Jos Buttler and Ben Stokes will be a huge loss for Rajasthan Royals; Jos Buttler has the single handily won a couple of matches for Rajasthan Royals. It will be difficult for Rajasthan Royals to find their replacement, especially in this crucial match. Royal Challengers Bangalore would not like to tinker with their winning combination. Rajasthan Royals and Royal Challengers Bangalore have played 16 matches against each other head to head in IPL and 2 matches abandoned due to rain. Out of 16 matches, both teams have won 8-8 matches each. In last 5 matches with the results, Rajasthan Royals have won 3 matches and Royals Challengers Bangalore won only 2 matches. Last time they met was in IPL 2018, which was won by Rajasthan Royals. At Sawai Mansingh Stadium, Jaipur; Rajasthan Royals and Royal Challengers Bangalore have played 5 matches against each other; Rajasthan Royals have won 2 matches and Royal Challengers Bangalore have won 3 matches. Out of 6 matches played in Jaipur this season, 3 matches are won by the team batting first and 3 matches are won by batting second. Being a day match, the team winning toss would like to bat first. Looking at the condition 175 will be a decent score on this pitch to defend. Both teams, Rajasthan Royals and Royal Challengers Bangalore need to win this match to be in the race for playoffs. Rajasthan Royals have a poor Net Run Rate of -399 which need also to be along with winning the match to be ahead in the race. On the other hand, Royal Challengers have their last three matches and need to continue it. RCB have got the momentum at the right time. 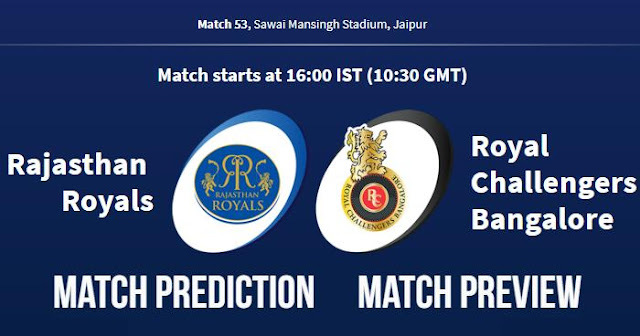 In our prediction, Royal Challengers Bangalore are likely to win this match.